Chinese chicken salad is to an extensive menu as “Don’t Stop Believing” is to karaoke. It is the ultimate go-to. History has proven that, without fail, you will find satisfaction with this choice. A cold bed of cabbage topped with juicy chicken, silky dressing, and those delicious crispy things. 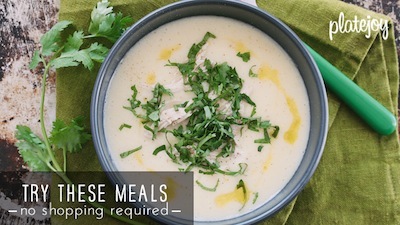 It is delicate enough to make you feel healthy, but full of savory bites so that you feel full. 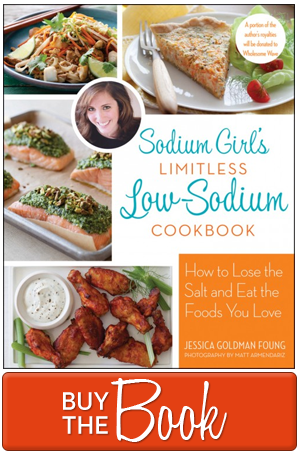 Now, as you’ve probably guessed, most prepared versions contain a high amount of sodium due to either the dressing, which is usually soy based, or the spice blend used to flavor the chicken. As usual, though, it is entirely possible to recreate a low sodium version of this dish at home and lucky for all of us, Boy’s Dad has passed along a legit recipe for success. The key to recreating this dish in a low sodium version, without loosing any flavor, is a special blend of spices, which Boy’s Dad has coined: Chinese Five Spice plus One. 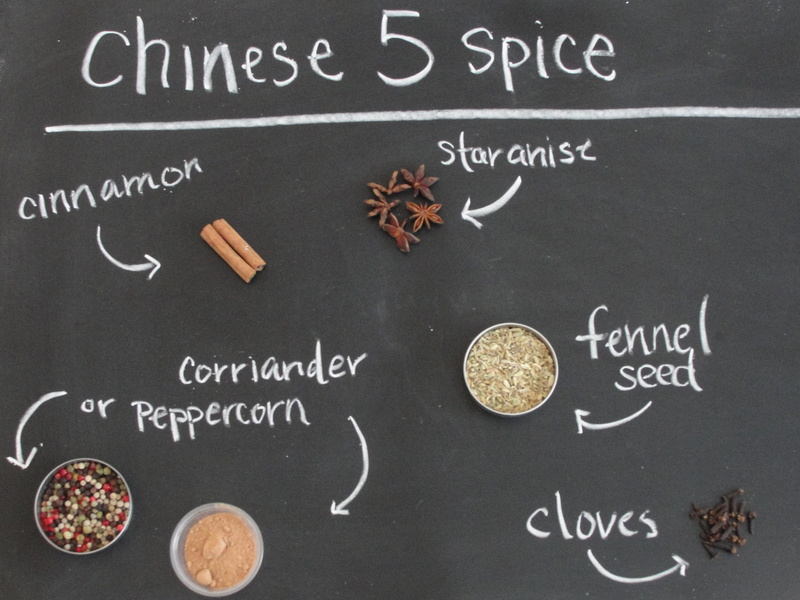 A traditional chinese five spice blend contains ground cinnamon, star anise, clove, fennel seed, and either coriander or Szechuan peppercorns. See below for greater detail and please forgive the misspelling of coriander. It was early and I took some creative license when I made this Thomas Keller Tribute Spice Diorama. Lord knows I love that man… and a blackboard. Then, Boy’s Dad kisses tradition goodbye, a rebel in his own right, and adds ground garlic to complete the dish. It is the addition of this single aromatic, plus a good, long marination-marathon, that gives the chicken thighs a rich flavor in need of no soy. Throw on a simple dressing of sesame oil and rice wine vinegar and a handful of those crispy things, and you’ve got yourself a dish that will dazzle ladies at a luncheon, hungry boys at a super bowl hang, or even your little own self while you watch the finale of Amazing Race. Did that end already? You will find great success and good food … in this blog. 1. Mix the 5-spice and garlic powder and use it as a rub on the chicken thighs. Leave the rub on for at least 4 hours and best overnight, covered in the refrigerator. 2. Heat the oven to 350 degrees and bake the thighs for 15 minutes. 3. Brush olive oil on the chicken and broil (on low) to brown. Remember to flip once the first side is golden delicious. 4. Allow the chicken to cool to room temperature and cut into slivers. 5. To prepare the dressing, mix the vinegar and sugar and heat (in microwave or on stove) for 30 seconds to dissolve the sugar. Add the rest of the dressing ingredients and mix. 6. Wash and dry the lettuce and cabbage and cut into ¼ inches strips. 7. Heat up ½ cup of olive oil on a flat skillet and add the mai-fun. The noodles will quickly turn crispy, so keep your eyes on them because they can burn easily. Use either tongs or a spider skimmer, which everyone should own because they look and sound awesome, to remove the noodles from oil and place on a cookie rack or towel to cool. 8. 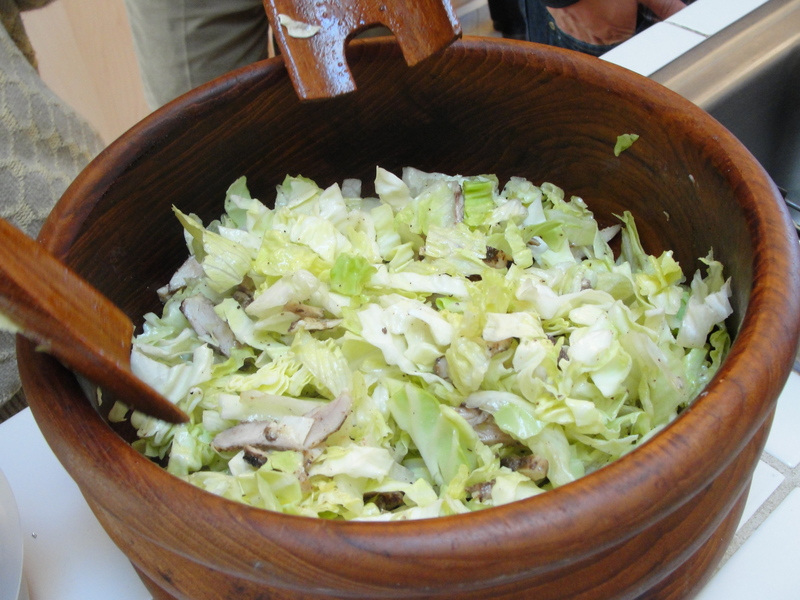 To assemble the salad, toss the lettuce, cabbage and chicken. Add dressing and toss again. Great tip from a Bi-Rite friend, use a salad spinner to evenly coat your salad with dressing. 9. 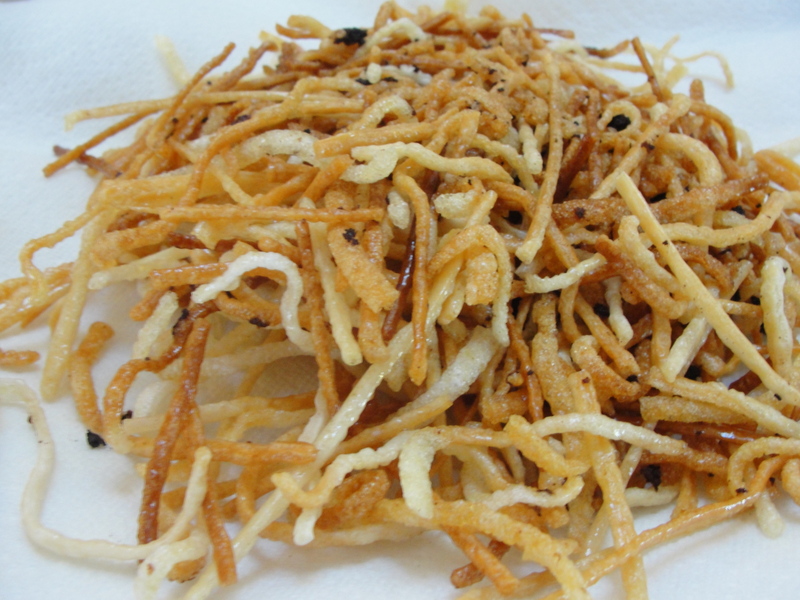 Add the crispy noodles on top and serve with the roasted nuts on the side. This site is simply fantastic. I thought you should know. I’m so inspired by your originality, ingenuity, and rockin’ photography. Go you!